The question I would like to discuss is whether or not modern sciences, specifically chemistry, have a little gratitude that must be paid to the alchemist of the past. Alchemy is often thought of as black-robed quacks who performed magic. Other terms often associated to them are wizards, magicians, witchcraft, magic, and voodoo. One must look at the information needed to fully think about this question. Alchemy is often associated with gold. Yes, it is true that a big part of alchemy was devoted to turning "impure" metals into gold. However, this is not the only thing alchemists were concerned with. Alchemy was inspired by the idea of man being perfect, free from disease and the limitations of our bodies. This is how their work on metals also began. Gold was seen as the "perfect metal" with silver following closely behind it. So why wouldn't they try to transform the "imperfect" metals into these perfect metals? Other subjects of interest to the alchemists were the Elixir of Life, Philosopher's Stone, Fountain of Youth, and the Powder of Transmuting. 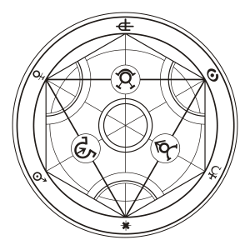 Alchemy was also based on a lot of concepts that should be considered. As stated earlier, alchemists were seeking after human perfection. The problems that they targeted were reasonable, but they then took them a step further that took their practices in the direction of magic. The Elixir of Life was meant to cure all diseases. Everyone has heard of the phrase fountain of youth, so I will not further explain this one. The Philosopher's Stone was the most sought after alchemical theory. This stone would allow the Alchemist to live forever and turn the base metals into gold. The Powder of Transmuting was also a powder that allowed Alchemists to transmute base metals into gold. This could be obtained without the Philosopher's stone. However, no alchemists was able to successfully turn any base metal into gold. Furthermore, the Philosopher's stone was never successfully created nor found. However, some of the practices that the alchemists performed in order to create or understand these concepts are still used today. My point of view is that the concepts they sought after were definitely on the magical side, using no scientific bases, but the techniques they practiced are still used in our modern day chemistry. 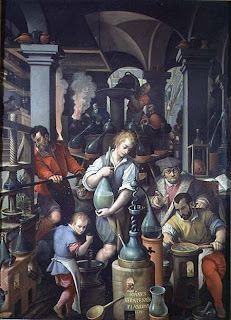 Three contributions to chemistry from the alchemists are lab techniques, use of synthetic medicine, and even some lab tools. Lab techniques discovered by alchemists are filtration, distillation, crystallization, extraction (anyone who has taken organic chemistry at Stockton knows how often these techniques are used), along with others. The idea of synthetically created medicine is also created to Alchemists. Before Paracelsus (an alchemist), only organic plants were used to treat diseases. He believed that minerals synthesized in the lab would be useful for medicine. However, his work went unnoticed for over a century after his death. Even still, his work laid the foundation to this new idea. Lastly, many glassware and lab tools are credited to the alchemists that are still in use today. Even some basic chemicals used by the alchemists in their search for Elixirs and the Philosopher's Stone are still currently used in the lab today. In conclusion, although the interests that sparked the research of alchemists is without a doubt tied to magic, their searching laid down the foundations of chemistry today. Without the frame work laid down by the alchemists, chemistry would not be as advanced as it is today. Someone had to start somewhere, and the alchemists certainly did a decent job for chemistry as we know it today. Jessica, I like how you included contributions to chemistry from the alchemists into your post. Great choice in topic and I found it very interesting. very interesting, being a chemistry major I've used many of these techniques and know how important they can be.